Ubiquity and intelligence are the two maxims of the post-PC world that Base places most importance on in its mobile CRM service. It makes sense. I have talked to several companies that see an opportunity in disrupting traditional CRM tools built for the desktop and the web. Salesforce.com, for instance, came into the market more than 10 years ago, long before mobile emerged. The UI is very much driven by filling out fields. That makes it difficult to use a CRM app on the go. It opens a new market opportunity for companies like Base that put a primary emphasis on developing a mobile web experience that makes data freely available across multiple devices. This week, Base introduced new native apps for the iPad and Android tablets that its founder, Uzi Shmilovici says brings the same ubiquity and intelligence to tablets that the company offers with its phone apps. The apps provide the same functionality as the phone apps Leena Rao wrote about a few months ago. With the service, users can capture, track and visualize sales leads, as well as manage contacts with notes, tasks and reminders. Base also supports Google Apps. You can send emails from Base using any email address. In total, the data is as much available on a mobile phone as it is on a tablet or via the web from the PC at the home office. Being too big to notice a technological shift – how come Siebel missed the web? They discounted it as being not relevant. We know what happened next. Same thing happens to Salesforce today with the move to post-PC. Being stuck with legacy code – achieving perfection on data sync is extremely hard. There aren’t many companies that achieved that kind of sync capability that we did. The traditional players are stuck with spaghetti code which is very hard to maintain, let alone leverage to sync data perfectly across devices. For months, Salesforce Android app could only read data! Not thinking about the users. The traditional players are thinking how to sell more licenses, complex systems, servers and to convince more managers to buy them. They are not thinking about the end user. We are all about designing an amazing experience for CRM users. It’s not all wine and roses for Base, which follows a freemium model. Their challenge is scale and finding new ways to develop its ecosystem. That’s the difference with a company like Salesforce.com. It is actively building a developer community to complement its traditional CRM tools. It has also developed a core social underpinning with Chatter, its enterprise social network. 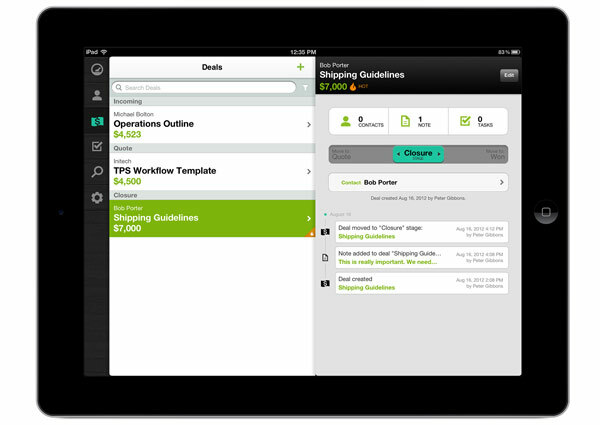 Further, it is extending beyond its core with workforce management apps like work.com. Base has raised $6.8 million in Series B funding led by Index Ventures with Social+Capital Partnership, OCA Ventures and the I2A Fund participating. The startup previously raised $1.1 million.